Genuine OEM Brother TZ241 Black on White Tape Cartridge. They are designed to work in the Brother PT-300,500,1200,2000 printer/copier(s). Premium Quality LC03BC Black, Cyan Inkjet Cartridge compatible with the Brother MP-21. The use of compatible supplies does not void your printer warranty. Premium Quality LC03MY Magenta, Yellow Inkjet Cartridge compatible with the Brother MP-21. The use of compatible supplies does not void your printer warranty. Premium Quality ER-320 Purple POS Ribbon compatible with the Brother SR 302. The use of compatible supplies does not void your printer warranty. 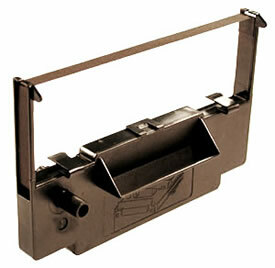 Premium Quality IR-72 Black Ink Roller compatible with the Sharp EL 2269/ EL 2189/ EL 2169/ EL 2168 POS. The use of compatible supplies does not void your printer warranty. Premium Quality RBSR402P Purple POS Ribbon compatible with the Brother SR 402. The use of compatible supplies does not void your printer warranty.